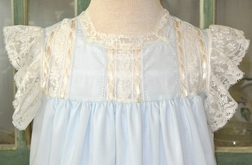 This is one of our newest lovely heirloom dresses made in your choice of white, ecru, light pink, light blue or lavender. It has French lace flutter sleeves with the bodice embellished with beading, satin ribbon and French lace. 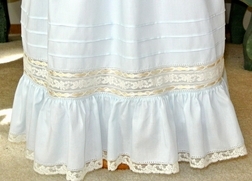 The skirt has 3 small horizontal tucks above the same beading, satin ribbon and French lace design as is on the bodice. The dress is completed with a pretty ruffle trimmed in French lace.